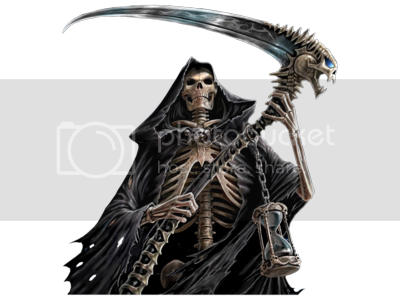 Is it mere coincidence that the Grim Reaper is holding a scythe? as in a grain farmer's implement ?! (wasn't sure what punctuation to use there so i just went with both.) ::: cue dramatic music ::: Or is it just another hidden layer of meaning on the tattoo I will likely never get? :-)) True, he probably has terrible headaches all of the time too. I didn't mean avoiding gluten would make you immortal :) Ashley seems to have gotten my "point". Is there gluten in salmon mousse? Thats probably why. I once visited Romania and got on a rural bus on which half the other passengers were farm workers each carrying a huge scythe :) Times havent changed much in some places. don't worry Matthew I still use a scythe when harvesting goodies for our goats in places they can go. I'm pretty sure that, no matter how perfect your eating, you're still going to die. maybe he's just gassy from the gluten. that could be a damper to any archetypal symbol's confidence. More like scythe in one hand, gallon jug of canola oil in the other. because you're from Scotland and you guys have lots of grass to mow? and green everything? Scotland really is quite beautiful. Downvoted for joking, lol, alright then. I still associate scythes more with mowing grass for some reason. lol wikipedia for the win. no i think being killed by grains is just fine with the paleo concept... but if you'd like, how about the grim reaper holding a scythe in one hand and a three headed lion on a leash with the other? Yes, I love it. But today the Grim Reaper is driving a $500,000 green John Deere Harvestor paid for by your tax dollars. He's not looking very healthy these days. I'm pretty certain the grain gluten has had a significant impact on his body composition. I mean... look at his bone structure. He appears to be quite disturbed. I have often wondered if some kind of autoimmune personality disorder from his wheat harvest is plaguing him. We have talked about looking at the physical form of the health gurus of Paleo, and some have noted that it's tough to follow a person who doesn't seem to be a positive walking testimony for their lifestyle. Well... I dunno bout you, but I might have a hard time getting motivated to look like this guy. He's also a bit pale in the face, almost like he is malnourished or something. Maybe it's too much phytic acid? Or maybe the gluten proteins have completely eroded the lining of his gut, which then led to total erosion of the remainder of his body including his skin. I bet his vision is suffering too. We don't know that for sure, but is it really that much of a coincidence that I know TONS of people on the Standard American Diet that look just like this? So there you have it folks... I don't think it's a coincidence at all. Ye be warned.. mu-ah ah ah! Little known fact: the grim reaper's fingertips are made of pure gluten. Avoid the touch of death. Scythes were first used for mowing grass to produce hay to feed to livestock. Only later on did the scythe replace the sickle and so were also used for harvesting cereal crops. Suppose we need a new symbol for death then. Maybe a wild animal? Getting mauled by a lion seems pretty paleo. See the May 19th Rubes comic strip. According to Family Guy, the grim reaper can't seem to get a date. Must be the scythe.